Fancy a perfectly cooked steak? Look no further than the Rare Steakhouse, the first restaurant you'll probably see as you step out of London's Baker Street tube station. The difference between Rare and other steakhouses is quite simple - the price. While other steak dinners end with an over-inflated bill, at Rare everything from the grill specials to your pick of the considered wine list and the deliciously indulgent puddings is realistically priced, making your evening out totally guilt-free. In this attractive and comfortable dining room you'll be offered not only your pick of steaks, cooked to order but a classic English, American or Continental breakfast, hearty dinner classics including pies and a host of healthy salads and lighter bites. 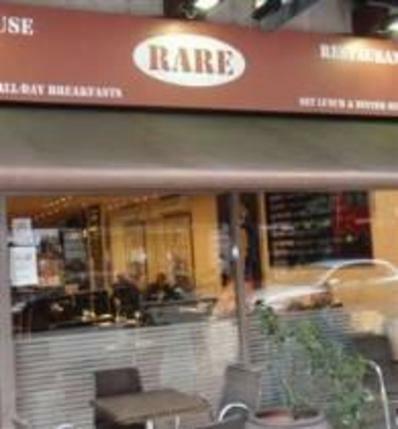 With its convenient location and vast, purse friendly menu Rare Steakhouse is perfect for business dining, post shopping nibbles and family dinners on a budget. Rare Steakhouse & Brasserie gyms, sporting activities, health & beauty and fitness. The best pubs near London Rare Steakhouse & Brasserie. Rare Steakhouse & Brasserie clubs, bars, cabaret nights, casinos and interesting nightlife. Where to have your meeting, conference, exhibition, private dining or training course near Rare Steakhouse & Brasserie. From cheap budget accommodation to luxury 5 star hotels see our deals for Rare Steakhouse & Brasserie hotels, including Park Plaza Sherlock Holmes Hotel London from 74% off.